What is Ping / Download / Upload ? POWER CYCLE YOUR ROUTER! Most issues can be resolved by simply turning off your router. Unplug the power cord for 10-15 seconds. Then plug the power back in and wait about 3-5 minutes for you router to fully boot before checking your wifi signal again. Cause: Are you too far from your router? Most routers have a great range, but if they are not centrally located in the house you may not be getting full coverage. The farther from the router, the more unreliable the connection will become. Fix: Simply move closer to the router and check your speed. You can also raise the router up onto a shelf or stand. The higher up the router is, the more effective the coverage will be. If that doesn't correct the problem you may need an additional router to cover any "dead zones." Cause: Not enough bandwidth. Are there other people at home using the internet? If so, they may be using up all the bandwidth of the package you are on. Each device (TV, phone, tablet, Xbox) can use more data than you think. Microsoft Windows Updates can also be running in the background on your computer. These updates are often very large and will use all of your bandwidth when they are downloading. Fix: Disconnect any devices you are not using. If others are using services like YouTube or Netflix, have them temporarily disconnect and see if that clears up the speed issues. You can also connect devices directly to the router with a Cat5 cable to rule out any wifi interference issues. But, the problem may be that you just don't have a fast enough package to support all your devices at once. Notify CTWA if you would like to upgrade your speed to a faster package. Are you connected to the WiFi Router? Fix: Make sure that your devices are connected to the router and your phone or computer is not in Airplane mode. It is possible the router has reset and the WiFi name is no longer there. Look on the back or bottom of the router for the default WiFi name and password/pin code. Is the power to the router and the PoE connected (what is a PoE)? Check the power to the router. 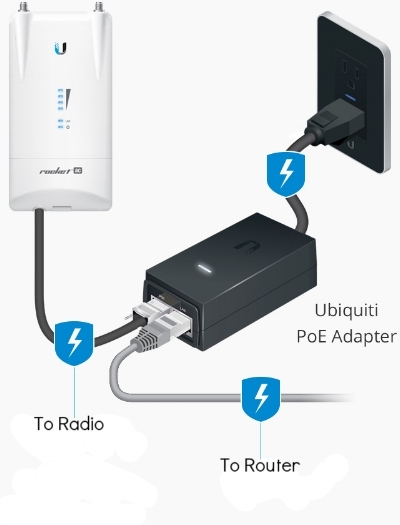 There should be a power light on the router and a white or blue light on the PoE (the PoE is the power supply for the radio that is mounted outside). The router may have a power button on the back, as well. Make sure it is pressed in. If there is no light on the PoE, contact CTWA for a replacement. IF you still have no internet after these steps, contact CTWA Tech Support so we can check your radio on our network. You can use the chat window in the bottom right corner of this page. wHAT IS pING, dOWNLOAD, uPLOAD? Bandwidth, usually expressed in megabits per second (Mbps), is the amount of data that can be sent or received by your system over the network per unit of time. Bandwidth is what you typically pay for when you purchase Internet service—with most home Internet services, more expensive plans provide more bandwidth. Neither upload speed nor download speed significantly impact ping. Ping is a measure of latency. You could have a 100 Mb/sec connection with 100 ms of ping and a 1 Mb/sec connection with 10 ms of ping. Latency is generally independent of bandwidth. Latency, as commonly measured by ping times, is an indication of how long it takes for your system to send data to another computer and to receive its response. Latency is influenced primarily by how far the data must travel—it takes much longer to access a web page on a server that is halfway around the world than one that is on a server next door. Longer communication routes, where the data must pass through many switches and routers, increase latency as well. Although higher bandwidth can improve latency during times of congestion, under normal conditions, the two are generally independent. Satellite Internet service, for example, provides good bandwidth (up to 15 Mbps), but suffers from poor latency, averaging about 700 ms ping. This high ping is due to the nature of satellite Internet service, which requires beaming data up to a satellite and back down. Conversely, a dedicated T1 line has only 1.5 Mbps of bandwidth but can provide latency as low as 10 ms. In most locations we need "line-of-sight" from the service location to our towers. This may be accomplished by setting up a tripod with a 10, 20, or 30 ft pole to clear any obstructions such as trees (this equipment is in addition to the standard installation cost). Most houses only require a small satellite arm mount on the roof with our dish attached to the arm. We require one wire routed from the dish to the wireless router inside the house for the service to work. Installation can take anywhere from 1 - 3 hrs.